Jakob had a "Terry Fox Run" at school and the kids were supposed to be walking right in front of my parents house. 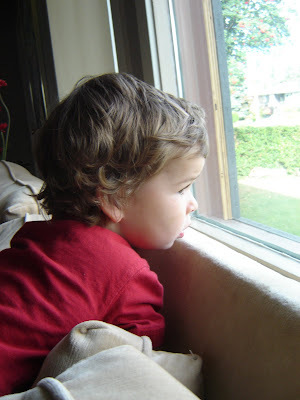 Levi was looking out the window waiting to see his big brother walk by. Jakob didn't end up walking past the house, the kindergarten kids walked the shorter route, but Levi had a good time watching the older kids, looking to find his brother in the crowd.